With chilly winter weather comes the need to bundle up young children prior to setting foot outdoors. But how does that bulky winter coat affect your child’s safety in his or her car seat? Puffy outerwear and car seats can be a dangerous combination, experts say. The extra padding intended to protect kids from frosty temperatures can impede the effectiveness of car seat harness straps. Car seat technician Ashley Simpson asks parents to imagine themselves in a bulky snowsuit while putting on a seat belt, then imagine taking the snowsuit off and putting the belt back on. The American Academy of Pediatrics (AAP) makes a similar statement, noting that bulky winter coats and snowsuits can compress in a crash and lead to increased risk of injury. “In a car crash, fluffy padding immediately flattens out from the force, leaving extra space under the harness. A child can then slip through the straps and be thrown from the seat,” the group explains. Instead of strapping a coat-clad kid into a car seat, the Academy recommends dressing children in thinner layers and tucking a coat or blanket around your child over the buckled harness straps to keep them warm. So, how can parents tell if their child’s coat is too bulky to be worn underneath a car seat’s safety straps? Lorrie Walker, Training Adviser and Technical Manager for Safe Kids.org, offers a few pointers. “The problem with the ‘puffy’ coat is that the harness may appear to be tight on the child when in fact, there’s too much space created by the soft fabric between the coat and the child.” Walker told BabyCenter. 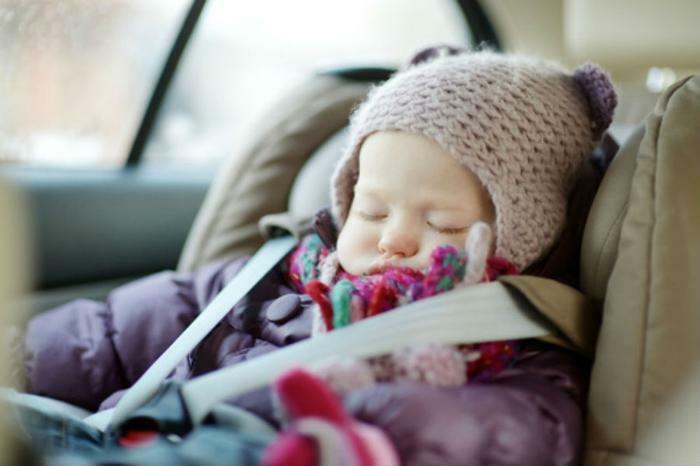 After warming your car, place your child in the seat and adjust the harness like you always do. Without loosening the harness, unbuckle it and remove the child’s coat. Put the harness back on the child without the coat. The harness should pass the “pinch test.” To perform the pinch test, see if you can pinch excess webbing at the shoulder. If you can, the harness is too loose and is only protecting the coat. Tighten the harness until the child is strapped in properly. The straps should be coming from at or below the rear-facing child’s shoulders OR at or above the forward-facing child’s shoulders, Walker explains.